Melissa Cartier: Revlon by Marchesa GIVEAWAY! Aren't these Revlon by Marchesa beauty tools gorgeous? I have a horrible habit of judging a product by it's packaging. I have (on more than one occasion) purchased a product that I have already bought in the past and disliked, solely because they spiffed up the packaging. A classic tale of it's what's on the inside that counts. 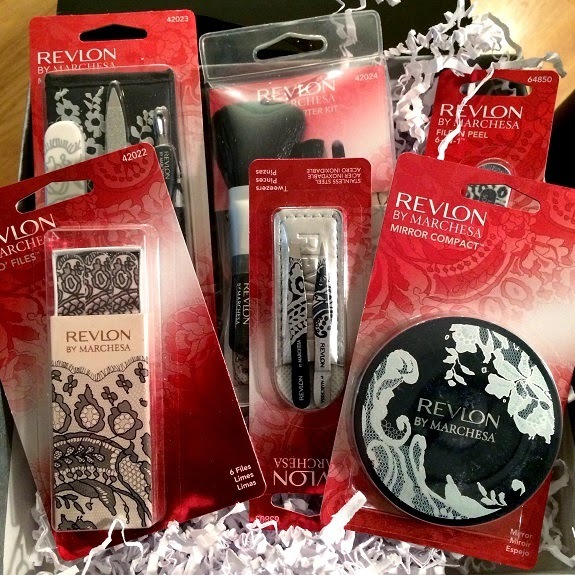 Luckily, these Revlon beauty tools are just as high in quality as they are beautiful. My favourites are the mini files and the mini tweezers. You can tell how excited I was to open them because I didn't even notice they were upside down in my display before I photographed them. DON'T JUDGE ME. I'M HUMAN AND FLAWED. They are available in stores but I am giving a set away to one lucky (Canadian) reader! The package that the winner receives will also contain a set of limited edition Revlon by Marchesa Nail Appliques that are no longer available in stores! All you have to do to enter is comment below and tell me that you want to win this lovely prize! That's it! Easiest giveaway ever? Great! Tell your friends! I will be drawing the winner at 8am PST on March 26th! Make sure you leave me an email address in your comment so I can contact you if you win! While it's not required, I do recommend that you go follow the Revlon Canada Facebook page because they are giving away a ton of goodies over there, including Marchesa clutches. *This contest is open to Canadian residents only. Sorry to all of my international friends! I couldn't resist the mini tweezers in store, but I would love to get my hands on more goodies! I would so love to be included. I totally want to win! The packaging is so pretty! I love the designs on all of the products and would love to win! I would love to win this dainty set of tools! I live abroad but still have my Canadian address so I'd still love to win! Welcome back and yes, I would love to win. OMG so pretty! *drooling* Thank you for the chance, Id LOVE to win! I would ABSOLUTELY love love love to win this! Love the combination of these two amazing brands!! I'd love to win this! What an awesome package! I want this!!! What a gorgeous set! I'd love to win this lovely prize!! I'd la-la-love to win this! The print is so beautiful! I want to win because I need those tweezers badly! !